Critical complaint of the direction of Pixar’s sequel-driven mentality over the past decade has devolved into a sniveling murmur. Sure, I long for the days of the trinity of Pixar original content (Ratatouille, WALL-E, Up), but I’ve come to admire (or perhaps more accurately, accept) their Soderberghian one-for-them, one-for-me maxim that offers gifts like Inside Out and Coco in exchange for the likes of Monster’s University or Finding Dory. Yet Pixar’s sequel problem tends to do what most other sequels tend to do: that is, they fundamentally decline in quality when compared to their novel predecessors. And yes, that includes the Toy Story films. Don’t @ me. Brad Bird’s Incredibles 2, however, is the studio’s most persuasive argument for serializing their content. It’s certainly the most accomplished sequel in the studio’s filmography, and the one film that, if not surpassing the breadth of its predecessor, at least comes closest to matching it. Immediately following the events of the first film, Incredibles 2 finds the Parr family (father Bob/Mr. Incredible, mother Helen/Elestigirl, brooding teen daughter Violet, precocious son Dash, and baby Jack Jack) saving their town from the comically menacing Underminer. The family fails to apprehend the villain and mount a lofty sum in collateral damage, forcing them once again to go into hiding, this time without the aid of a government sponsor. An intriguing dinner conversation ensues from the pent-up frustration that comes with being super-powered but restricted in their capacity to utilize their gifts in any meaningful way. It’s an argument that recalls a similar conversation held at the beginning of Brad Bird’s first film. But this time, the sentiment is encouraged by a rather direct discourse on the unjust strictures confining a family, where assimilating suggests a deficiency in character. When a character advises the Parr’s that they’re “just as illegal” as them, the line reverberates with a topical urgency. In an effort to recover the public image of superheroes, venture capitalist Winston Deavor and his tech-savvy sister Evelyn recruit Helen as their model for what constitutes a socially acceptable superhero. A marketing campaign centers the conversation around Helen’s heroics, as she combats a mysterious figure named Screenslaver. The villain hypnotizes victims looking at television screens as he condemns our screen-obsessed culture. As you’d expect, Winston and Evelyn’s marketing campaign to rehabilitate Helen’s image and Screenslaver’s censure is the sort of commentary the operates as both text and subtext, informing the film’s larger concerns on perception and reality. This aspect of the film is coupled with a more straightforward, Mr. Mom-esque narrative involving Bob accepting his role as a father as he becomes a more resonant presence in his children’s lives. These asides are filled with the sort of obvious jokes that wear a bit thin, as Bob haphazardly attempts to correct wrongs involving Violet, help with Dash’s math homework, and simply making sense of Jack Jack’s new super powers. It’s both overdone and under-examined, which makes these sequences resonate with the urgency of a hiccup, especially when compared to the film’s central narrative. 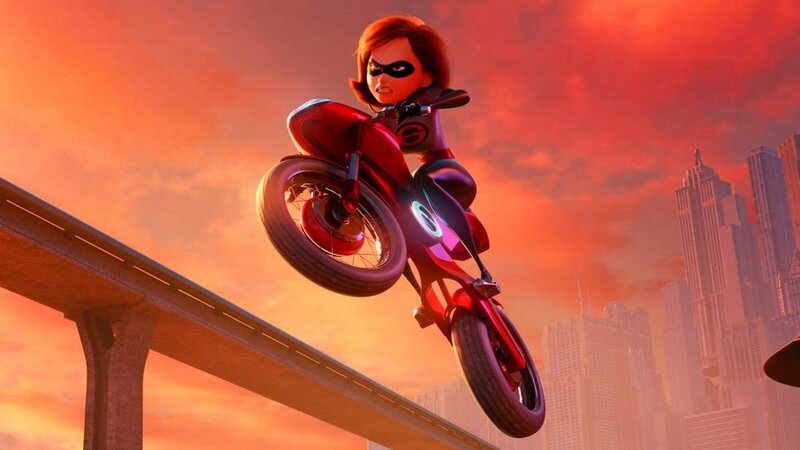 More discerning viewers will see how Incredibles 2 mirrors The Incredibles, shifting the gender dynamic in a rather subtle though nonetheless profound way. Helen always echoed most profoundly within this ensemble, whether it be her unwavering commitment to her children in the first film or the rigidity of her moral code in this sequel, her quote unquote superpowers always registered as superfluous to the sacrifices she made for her family. It’s why I found Incredibles 2 so persuasive, in part that it offers Helen a headlining platform. As cumbersome as some of the film’s narrative may be, it’s Bird’s focus on Helen that really allows Incredibles 2 to sing.